“Bet you can’t eat just one.” Remember that potato chip commercial? Well, as it turns out I’ll bet you can’t stop at just one set of Stillpoints, either. That’s certainly been my experience. They are like mushrooms. Every time I looked in the studio more seemed to have popped up. To be clear, eight Stillpoints Ultra SS isolation footers and threaded adapters appeared at my door almost overnight from Legend Audio and within hours found their way to being installed as replacement footers on my two McIntosh MC2301 tube power amps. That makes five sets of four Stillpoints in the studio sound system, a set of Ultra Mini’s under the Esoteric K-01X, the McIntosh C1000C controller, the McIntosh C1000P solid state preamp, and now a set of four Ultra SS isolation footers under each MC2301 amplifier. In every application of Stillpoints under a component advances were revealed that were not present before the Stillpoints were installed in my studio sound system. The background seemed to become inkier black while the resolution of the system developed greater focus. The sound stage gained an additional degree of width and depth while transient dynamics gained speed and are more clearly defined. So it went with each additional set of Stillpoints I added to the sound system. The perimeters noted above became cumulative. Each new set of Stillpoints supporting another component added more of what was previously conveyed in the system. I continuously questioned myself. How can a sound system that is already remarkably good have its performance elevated once again? Obviously there was only one way to find out and thus the arrival of two new sets of four Stillpoints Ultra SS in black. As I researched Stillpoints products I developed a layman’s fundamental understanding of the technology that makes Stillpoints so effective at transferring vibrational energy into heat. It all stems from the way the Technology Pockets and ceramic balls in them have been engineered for their specific purpose, plus very close tolerances of the assembled parts. Any way you look at this technology it is unique, high quality, and the performance results speak for themselves. I was going to wait for a friend’s arrival later this week before attempting to install the Ultra SS footers on the MC2301’s. When it comes to handling these amplifiers alone they are big heavy beasts. None the less, once I had the eight beautifully finished Stillpoints Ultra SS in my hands I could not resist getting them installed. It took me the better part of an hour and half to complete the installation on both amplifiers. After disconnecting input cables, speaker cables and power control cables I pulled the amplifiers on the amp stands out into the room and used a block of wood to secure the amplifier tilted to one side and then the other as I removed the factory feet and installed the Ultra SS footers with their perfectly made ¼-20 to 10-32 adapters. These adapters facilitate installing the Ultra SS using the factory threaded holes on the amplifier’s bottom plate. Stillpoints manufactures these adapters in various thread sizes to accommodate a wide variety of requirements. Once the Ultra SS footers were installed I had to make sure the hat side of the footer was loosened from the base in order for them to operate properly. I installed the Ultra SS on both amps, slid the amps on their stands back into place, reconnected the cables, and took a short break. I needed it. Wrestling the MC2301’s is a chore, and of course I was being extra careful not to lose control and have an amplifier tumble off the amp stand when tilted high enough for me to use a stubby Philips head screw driver to remove the factory feet and get the Stillpoints Ultra SS installed in their place. Okay, break over. Now it’s time for the real work. I mean someone has to sit in this beautiful room and audition the sound system with these new footers in place. Will these new Ultra SS footers actually elevate what is already an astonishing performance level, or will I be left wondering why I allowed myself to go down this rabbit hole? Let’s find out. I energized the sound system and let it warm for 30 minutes while on my break so everything was ready to go. The sound system includes a McIntosh C1000C/P solid state preamp, a pair of McIntosh MC2301 tube power amps, Sonus faber Amati Anniversario speakers, Aurender N10 caching music server, Esoteric K-01X DAC/CD/SACD player, Wireworld cables including balanced Silver Eclipse interconnects, Platinum Starlight digital coaxial cable, Silver Eclipse speaker cables, and Silver Electra power cables. Regenerated AC power is delivered to all components by a PurePower 2000 fed power through a Furutech Flux 50. First up is the ol’ audition standard, Diana Krall – Girl In The Other Room, “Temptation”. This version is a 24 Bit/96 kHz HDTracks download played from the Aurender N10 to the Esoteric K-01X DAC. All music in this audition was played with the same source components. Using the Aurender iPad Conductor App I tapped the song title and the room filled with music. My first and immediate impression was an improved acoustic bass tone. Bass strings and wooden body of the acoustic bass instrument clearly portrayed individual tones that combined beautifully to present a lifelike texture and timbre. Drum snaps felt more dynamic. The tambourine rang with outstanding metallic zest and clarity, and the Hammond organ that accompanied the piano was well separated from other instruments such that even when played at very low levels the B-3’s sound continued to be focused and clear. Diana’s voice was prominent in the center of the sound stage allowing accurate perception of her place in front of the other musicians. The studio sound system has always reproduced the Diana Krall recording very well. With the Stillpoints Ultra SS isolation footers supporting the amps there is a stunning improvement in overall clarity and speed. Resolution seems more sharply focused thus adding to a precise refinement in the sound stage that encompasses all three dimensions of width, depth and height. Everything gained by the other components being supported on Stillpoint Ultra Mini’s has advanced to a higher level with the Ultra SS under the power amps. It is an inquisitive experience to hold an Ultra SS in your hand and imagine how it succeeds its objective. It is quite another experience to hear the results of this technology in action. It is extraordinary. Next I played Rene Marie – Sound of Red, “Sound of Red”. This is a 24 Bit/96 kHz recording. If this exceptional recording isn’t in your collection, it should be. At first listen I was once again struck by the texture and rhythmic wholeness of the acoustic bass that underpins this recording. Each note was pure and vibrant with an improved sense of energy. Rene’s voice was holographic in the room, clear as a bell with the kind of air that tricks you into thinking this could easily be a live performance. I noticed also that cymbals now rang and decayed with more energy. Drums skin vibrations could be distinctly heard with splendid tonal integrity and ample decay. Holly Cole – Temptation, “Looking For The Heart of Saturday Night” brought amazingly deep strong bass into the room. Despite its power the bass remained entirely independent, never overshadowing Holly’s voice or the other instruments. One thing about this recording that stood out to me with the new Stillpoints Ultra SS in place was the tremolo guitar in the right channel and the Dobro guitar in the left channel. Both instruments were played at a distance behind Holly’s voice and the strong bass, yet no matter how distant their sounds were in the mix the guitars remained clear, present, and fully fleshed out even at the micro level before silence set in. I have heard this performance a number of times but never took special note of these two instruments until the Ultra SS became part of the system. I could not pass up the opportunity to hear Liz Story on piano with Joel Di Bartolo on acoustic bass, “The Very Thought of You”. This is one of my favorite piano recordings. Not surprising by now, the acoustic bass definition was more focused and tonally rich than previously, less like a recording and more like a live performance. Liz Story’s piano performance with the Stillpoints in place is the best I have ever heard this recording. I know this song and the album like the back of my hand and was moved by the delicacy of individual notes, the richness of full chords, and the harmonic interplay of the piano strings during sustain. All the while Joel’s acoustic bass reinforced the song’s tempo without a hint of encroachment on the piano’s pristine sound. I reached for the Aurender iPad Conductor app and tapped on Lee Ritenour – Rhythm Sessions, “Rose Peddles”. Once again there was a firmer more robust bass. Lee’s guitar, the electric keyboard, and drums were perfectly separated in space. The guitar and keyboard played several bars of the exact same notes simultaneously and yet each instrument’s sound remained completely recognizable, elegant, and unclouded by the interplay while the solid bass continued to provide the rhythmic foundation in its own well defined space. It became clear from my listening sessions before and after installing the Stillpoints Ultra SS isolation footers under my amplifiers that they contribute in a positive way to my sound system performance. I would not have considered this level of audible enhancement possible without hearing it for myself. When a sound system already sounds spectacular it becomes a challenge to imagine there might be additional hidden performance attainable from something as inconspicuous as isolation footers. I was in that group for decades, but not anymore. 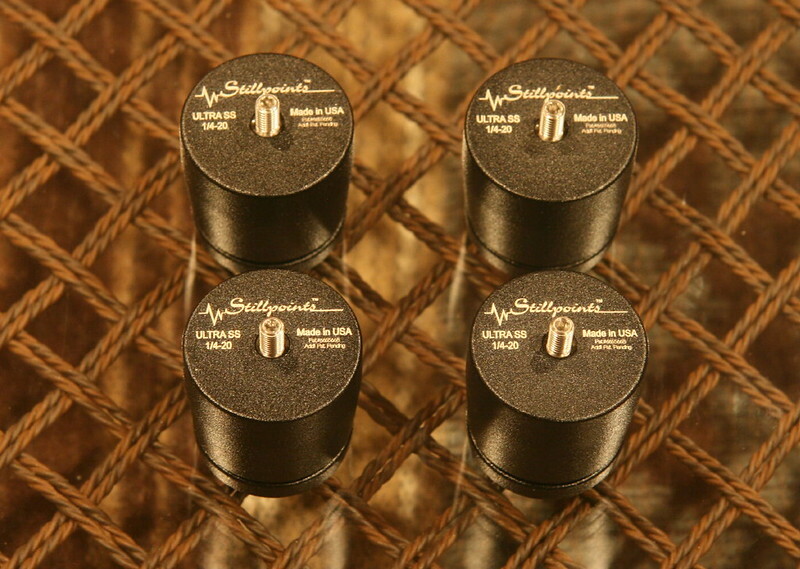 The Stillpoints Ultra Mini’s under my source components and preamplifier raised the bar, heightened my awareness of possibilities, and proved to be educational and inspirational. The Stillpoints Ultra SS under my power amplifiers have elevated the performance bar to a new level I was not even aware was possible. Listening to them supporting your components erases any shred of doubt about their value in a sound system. The price of admission into Club Stillpoints can be cause for pause. These isolation footers are not inexpensive. A set of four Ultra Mini’s in silver retails for $500.00. The cost can be overcome by installing them under one component at a time. That’s what I did. It eased the purchase anxiety while at the same time clearly demonstrated their worth in my sound system. That is what motivated me to keep going. Incrementally the sound just kept getting better. Of course there was no doing just one mono block amp when you have two so this last purchase required some procrastination. I am a first class procrastinator. A set of four silver Ultra SS retails for $996.00. Threaded adapters are sold separately. A set of four black Ultra SS retails for $1138.00. When viewed in perspective with what we routinely spend on premium interconnects, power cables, and power conditioners the Stillpoints isolation footers become quite attractive. Ultimately, the Stillpoints Ultra SS footers supporting my McIntosh MC2301 amplifiers have contributed a substantial improvement to my sound system performance. I consider the Stillpoints Ultra SS worth the benefits of improved resolution, dynamics, and clarity. I am very pleased with what I hear. There is another real bonus, Stillpoints require no break-in. They are ready to perform their magic right out of the box. The installation of Ultra Mini and the Ultra SS isolation footers has transformed my studio system in a positive and exciting way. If you are looking to raise your sound system performance to a new level, I can highly recommend Stillpoints isolation footers. They are the real deal. Last edited by jdandy; 05-12-2018 at 02:29 PM. But damn, I just did! 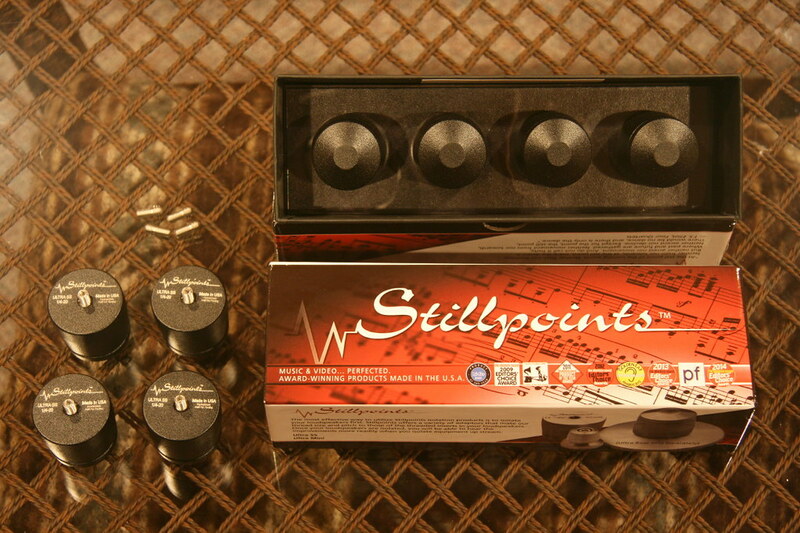 Dan, Stillpoints worked similar magic in my system - they are the real deal. Congrats on another great review! Dan... a Truly Outstanding review! Would you happen to have a photo of the Ultra SS feet on your 2301's? It pleases me greatly that you were able to once again raise the sonic bar of musical enjoyment! 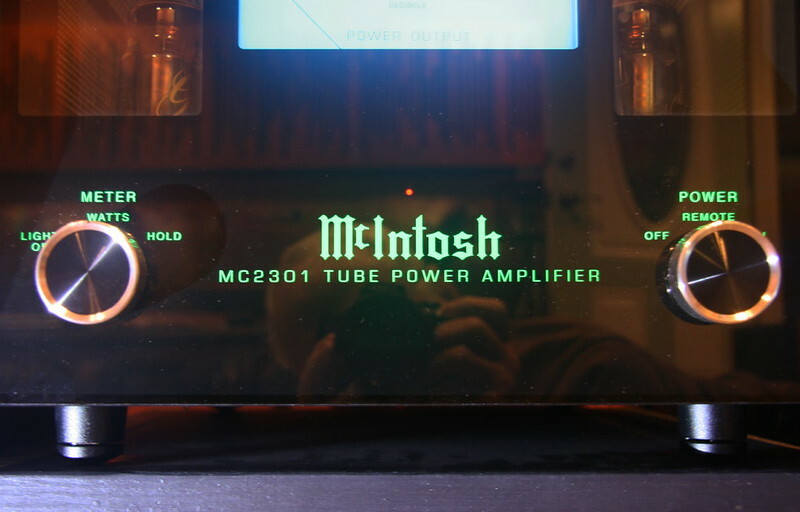 Ivan.......Here's a peek at the Stillpoints Ultra SS installed on the McIntosh MC2301 power amplifier. Last edited by jdandy; 05-04-2017 at 07:46 PM. Nice review Dan - is your equipment already on good isolation racks (I.e. the Stillpoints have added to what the isolation rack was adding)? Jamie.......My racks are not special isolation type racks, just regular ATI racks with aluminum risers and 1/2" thick tempered glass shelves rated for 200 lbs. each. Dan, Are your amps on Sounds Anchor stands? Craig.......My amp stands are custom wood stands, not Sound Anchors. What do you start with Amps, 2301s, or C1100, or D1100 or N10 or bat phono stage or TT? I know they won't work on my Strads.